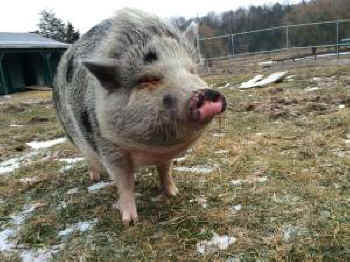 This adorable potbelly pig arrived at the Sanctuary just before Christmas. A long-time supporter rescued Mary Francis when her guardians lost their home and were unable to take her with them when they moved. Mary Francis was raised as an only pig and lived indoors. Losing her family must have been difficult, but on top of that she’s been transitioning to living life outside. Luckily, piglet Jasmine moved in herself just two months ago. She was living on her own in the woods when she was rescued and brought to CAS. The two of them quickly bonded and now spend their days digging up the ground as happy chickens wait nearby to see what they’ll find. Sponsor Mary Francis!Now that the temperature has dropped we’re offering Mary Francis the opportunity to relax in the kitchen with us. The other day caregiver Jenn laid down on the floor and Mary Francis settled in for some snuggle time. A good ear scratch and a slow belly rub seems to be the way to her heart. But afterwards she couldn’t wait to go outside to play with Jasmine. Each day ends with a walk to the barn where we built a new area just for them with thicker insulation. After a little romping they snuggle together and fall asleep in a pile of warm hay and blankets. 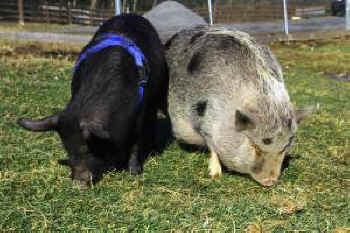 While we have fallen in love with Mary Francis, finding her a forever home would allow us to rescue another pig in need. If you would like to adopt Mary Francis or become a sponsor to help with her care, then please contact adoption and sponsorship coordinator Erin Murphy at (845) 336-8447 x232 or by email at [email protected].